Soften the butter and stir in the other ingredients until well combined. Place each sweetcorn cob on 2 layers of foil and spread the cobs generously with the herb butter. Roll up ensuring the parcels are sealed. 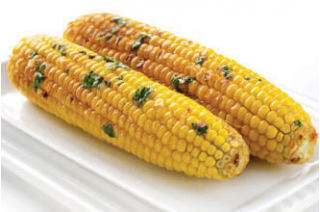 Cook the foil parcels on a grill over the hot coals for 12-15 minutes turning occasionally, until the sweetcorn is tender.